FS8340 discovered by Brandi Oswald, a Heidelberg University studentStudents working with the total station to map artifacts and features within the latrine. One of the first artifacts to be located within level 1 of Feature 124 (a latrine used in late 1862 or early 1863) was this 12-sided bottle. 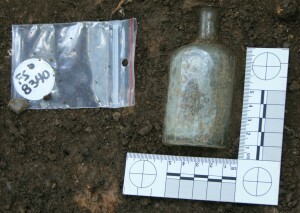 The bottle is just over 10 centimeters in length and 5 centimeters in width. We have yet to remove the bottle from the latrine, but expect to in the next day or two. Prior to its removal, it is mapped and photographed. As it is removed, the bottle will be bubble wrapped and boxed for transport to the Gilmor Archaeological Laboratory at Heidelberg University. Once we have it cleaned we will post another picture of this unusual bottle. This entry was posted on Thursday, June 24, 2010 at 8:13 pm	and is filed under Special Finds. You can follow any responses to this entry through the RSS 2.0 feed. Both comments and pings are currently closed. I was wondering, why wait so long to remove the bottle? I ask as a new student of anthropology, if it has been fully exposed and removed from the soil, why not just pull it out and mail it off? Given the weather in the area, I’d be concerned about large debrie from blowing trees and plants falling on, and breaking, the bottle. I have added some information to the post about leaving artifacts insitu until they are ready to be removed. This usually is done after the level in which they have been fully exposed has been photographed and mapped. It may take several days. Should there be some concern for the integrity of the artifact, we will remove it sooner but still trying to record all the revelant data. What a fascinating bottle. Do you know of any similar ones in books or which have been recovered from other sites? It resembles some food and pickle bottles but its mouth is so narrow. 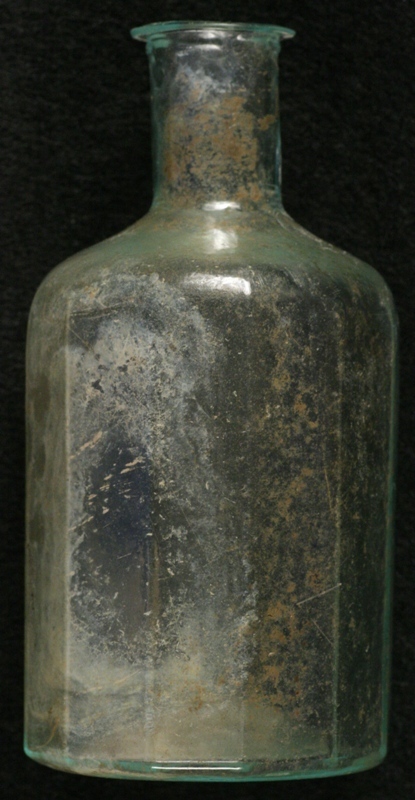 It is an interesting and unusual bottle considering our finds at Johnson’s Island. 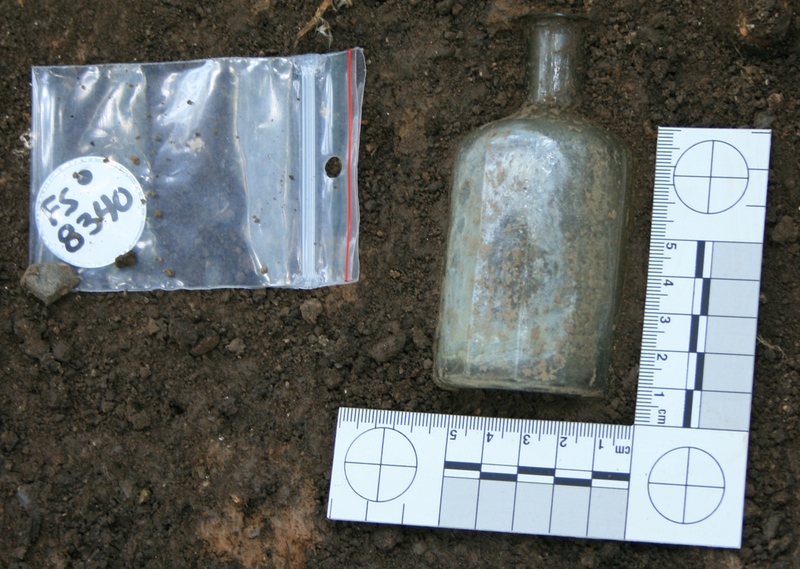 From what we have been able to discover, it most resembles a patent medicine bottle. We have yet to find one that is so short. There is one illustrated that is taller. As always, we will keep looking to try and figure this out. Now that makes sense to me! I can’t wait to be able to work on a dig! It all seems so fasinating to me, and to be able to assist in the discovery of items of history that haven’t been seen, much less held, in over a hundred years is amazing. I bet the whole area was just flushed when the bottle had been first noticed. What the hey? 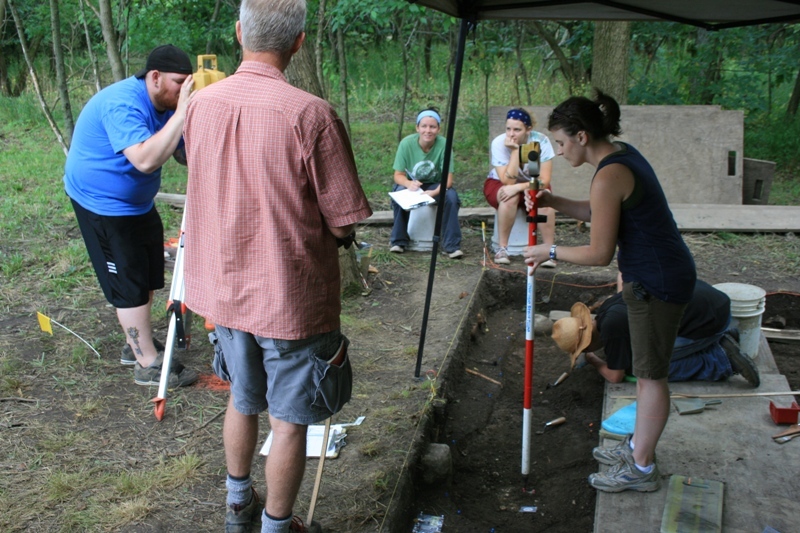 Why are students from Heidelburg University doing at an American Civil War site when there is so much older, and more interesting history right out their back door? I know firsthand that there is a huge complex of circa 1620’s, 30 Year War Imperial military camps within jogging distance of the university, and we would learn a lot more studying those latrine sites than those from 1862. Well Dan, the Heidelberg University in the USA is located in Tiffin, Ohio, about 50 minutes driving from the Johnson’s Island Civil War Military Prison Depot. Thus, the site is close to Heidelberg University, and we learn a tremendous amount from these 1862-1865 latrines. The Johnson’s Island Civil War Prison has the most intact historical and archaeological records of the over 65 prisons used during this war. Days to excavate a level??? Just wait until you get out into the real world. I just excavated a privy with 10 levels (level depth was initially 6 inches but we changed to 12 inches about half way through) and only had a few days to do the entire thing. That’s the world of CRM, and that’s how you will be expected to work once you graduate and get a job. Enjoy academia while you can. 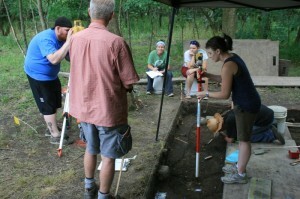 As a former Heidelberg student now working “in the real world,” I can attest that the sort of precise, “academic” approach used on Johnson’s Island is not only incredibly valuable in an archaeological sense, but also very beneficial to students. For those who continue in academia, it establishes a foundation of concern for the value of archaeological sites and a recognition of the importance of careful work. For graduates who enter the world of CRM, their work on Johnson’s Island makes them more efficient, insightful, and ethical diggers. Had Johnson’s Island been excavated quickly, we would have lost an incredible archive of information about the men confined there. Because the site is not threatened, we have been lucky enough to excavate parts of it in the most ethically and archaeologically responsible fashion. Like all archaeological sites, it represents a rich trove of information that we irreversibly destroy when we excavate it. Speedy excavation does not represent a more efficient approach to archaeology, merely a necessary one. Especially for students, an introduction to archaeology done in this precise fashion provides grounding in how excavation should be done when time allows. When confronted with sites which require more drastic action, it helps them approach the situation with care and precision. If anything, the world of contract archaeology needs to reevaluate how it approaches site excavations, reporting, and public outreach. Reforming this business requires action from the legislative level down to “the tip of the trowel.” It is up to every participant to ensure that we preserve, study, and interpret our collective past in the most culturally beneficial way possible. Thanks for your comments. This is a fascinating subject, and one which the field should engage in on a regular basis. This thing has twelve sides wow! My Granny had a small bottle like that and she told me it contained ” Laudenum ” a narcotic pain/nerve medicine . At least thats what she used it for. She was born not long after the war and remembered things her folks told her and things ” Known ” . I hope to receive your responding soon. I am chairman of The John W. Inzer Museum located in Ashville, Alabama. Lt. Col. John Washington Inzer was a prisoner at Johnsons Island from 1863 to 1865.
to turn him loose when the closed the prison. St. Clair Camp 308, Sons of Confederate Veterans is in possession of the 1852 antebellum home of Lt. Col. and Judge John Washington Inzer. We are restoring the home and making it into a museum in honor of Lt. Col. Inzer. Lt. Col. Inzer kept a diary while a prisoner at Johnsons Island and we have for sale a book titled “Diary of a Confederate Soldier” by Mattie Lou Teague Crowe. Ms. Crowe used Lt. Col. Inzer’s diary to write this book. It can be obtained through The John W. Inzer Museum in Ashville, Alabama. 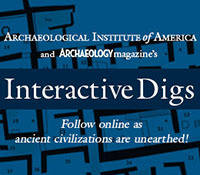 Excerpts from the Diary were published in Archaeology Magazine several years ago. I have seen many short, round or multiple-sided bottles in the UK and Ireland which have been identified as ink bottles. I have even seen well-preserved specimens with intact corks and dried ink inside. Would a swab of the bottle interior be worth investigating using ICP-MS?